This post has been compensated by Van’s International Foods. All opinions are mine alone. Mmm… waffles! May is basically brunch season if you ask me, friends! One of the best morning foods ever invented was no doubt waffles. 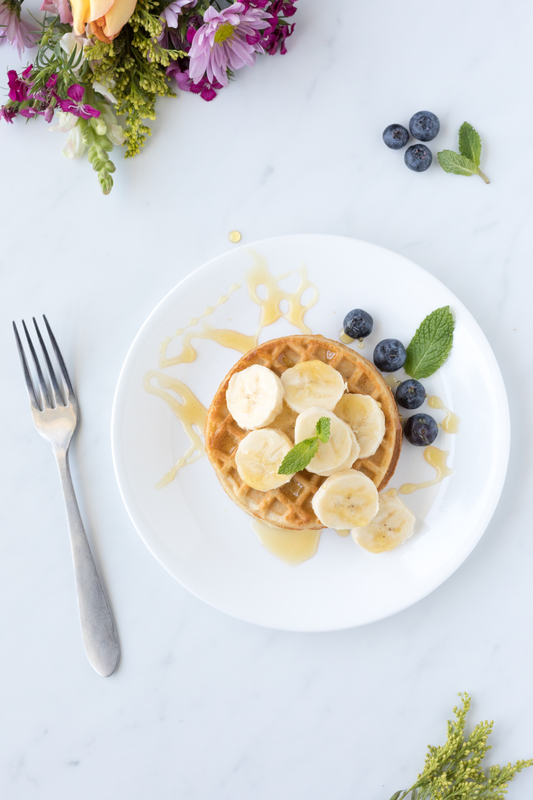 So, I’m really excited to share ideas on how to serve up gluten free waffles for breakfast in honor of Celiac Awareness month. 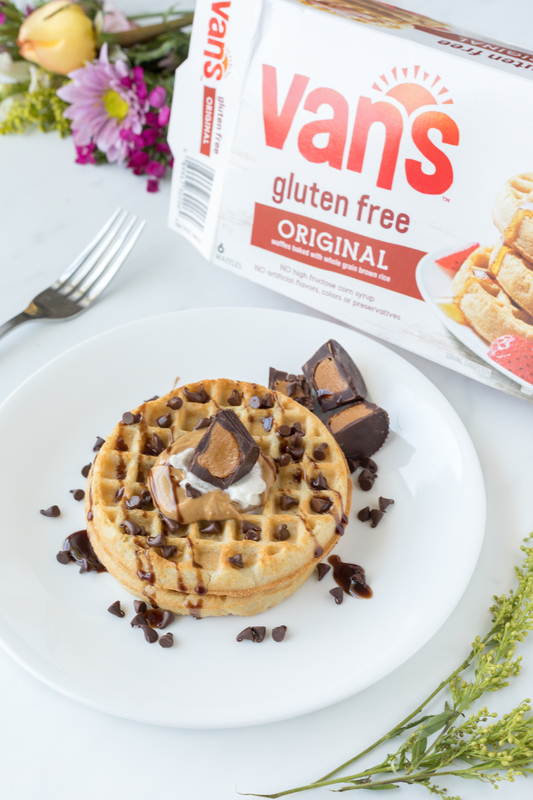 You’ll soon learn that you don’t have to sacrifice flavor with Van’s® Gluten Free Totally Original Waffles! Lately everyone that I talk to knows someone who is eating gluten free for a variety of reasons. My mother realized that she had a gluten intolerance back when we were living with her, so we often have to think outside of the box and get a little creative when we’re eating together as a family. With experience, and a little know-how, it’s possibly to find work-arounds that are just as delish as the original versions you may have grown to love. Luckily, we really hit the jackpot with the gluten free options from Van’s products and it’s a total bonus that we can find them right at our local Publix. Check out the current coupon offering here. Be the best gluten free brunch host! Little tip if you’re serving these gluten free foods to guests, make sure to double check all of your food labels to ensure they are gluten free like Van’s Gluten Free Totally Original Waffles are. Bonus! These waffles are ready in about 4 minutes in your toaster. Let’s get breakfast started, shall we? First up we have “banana split” waffles! Oh so yummy! Instead of ice cream, we’re using a little Greek yogurt so that it’s super breakfast friendly! Not that I wouldn’t eat ice cream for breakfast, but… this is a really surprising addition to a well-rounded breakfast. Then, add all of your favorite sundae toppings like sliced bananas, mini chocolate chips, nuts like peanuts. Then if you feel extra fancy, you can drizzle your creation with a little chocolate syrup, top with some colorful sprinkles and a cherry! This might sound a little over-the-top, but it’s SO easy to put together and it’s truly delicious! Seriously, don’t skip the yogurt on this one. If you’re hosting brunch, this is the one that will really impress your guests of all ages. Next, let’s try fruit and honey waffles for something fresh and unique! Bananas, blueberries and strawberries are my top picks for those gluten free breakfast waffles. Simply add your choice of sliced fruit or berries and drizzle with some tasty honey. I recently learned that raw honey is my favorite. SO good. The result? A perfectly hearty breakfast that can be enjoyed any day of the week. Lastly and definitely not least… I’m serving chocolate peanut butter cup waffles. Be sure to swap out for any kind of nut butter that you love most! 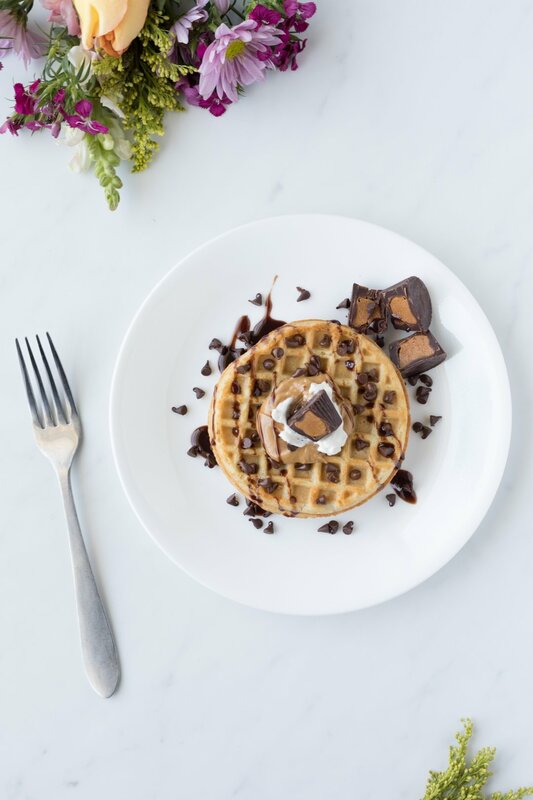 To make these perfect, I spread a little peanut butter right on top of my waffles and sprinkled mini chocolate chip as well as my favorite dark chocolate peanut butter cups. Then, a quick drizzle of chocolate sauce for good measure. For an over-the-top bite add a dab of whipped cream, too! And, that’s a wrap! 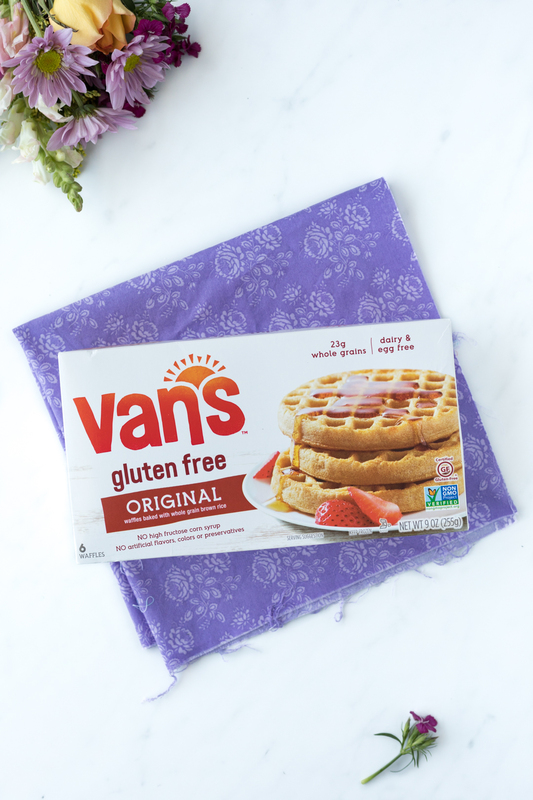 Who knew eating gluten-free breakfast could be so seamless thanks to Van’s Gluten Free favorites. They offer select waffles, pancakes and even French toast sticks in a gluten free variety (always check labels). As an added bonus, they are non-GMO project verified AND have no artificial flavors or preservatives! Also, guess what? They have more than just breakfast goods! They also have other options like these tasty Fire Roasted Veggie Crackers! They pack a lot of flavor and have an irresistible crunch. 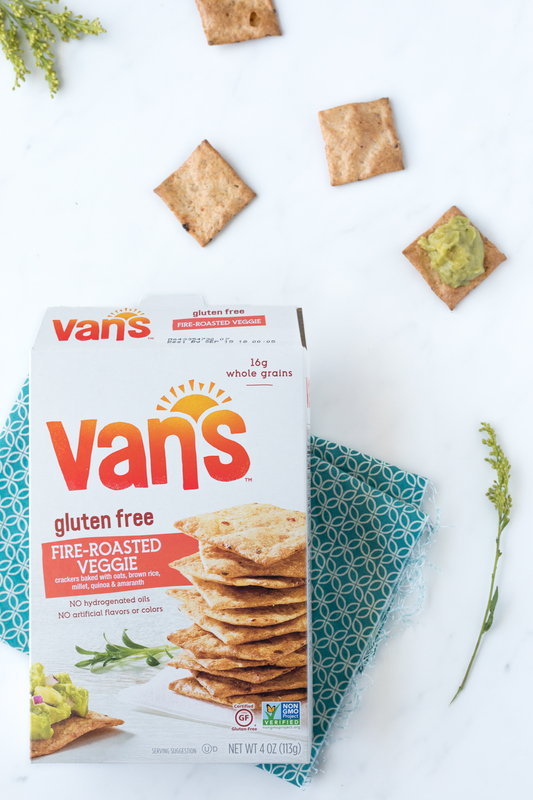 Learn more about Van’s offerings here and get a $2 off 2 Van’s product Publix coupon while it lasts. 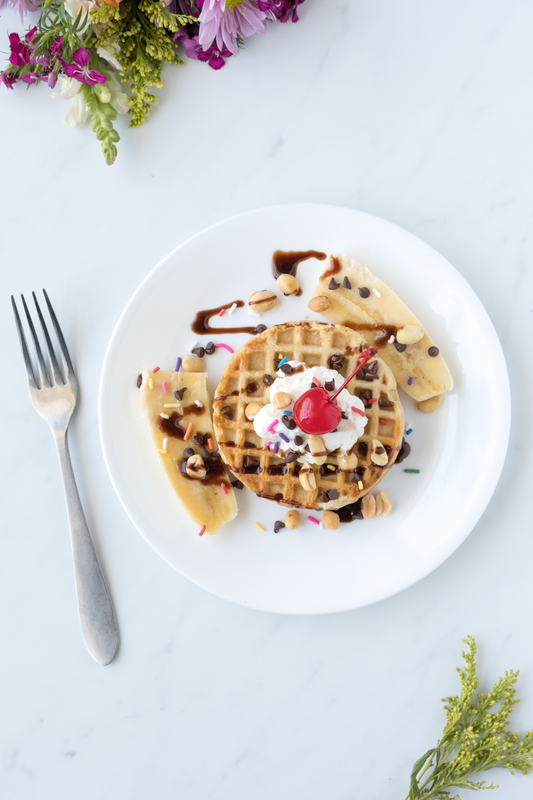 Make Publix your go-to source for Van’s Gluten Free Totally Original Waffles and more! Which of these tasty waffle ideas will you try first? These are great ideas! I will definitely try all these!! I think the peanut butter cup waffles would be my son's favorite! I'd love nutella and strawberries! My daughter loves Vans waffles. For years she has enjoyed them. I think those toppings are perfect to dress them up. I'm really happy you shared these waffles. We are doing an elimination diet to see if gluten is an issue for my son right now. He loves waffles so I will definitely get these for him asap. Thanks. Gosh...each one looks more delicious than the last, how is that possible? With so many people eating gluten-free it's a great idea to have these yummy waffles on hand! These look really good. We have just begun needing to go gluten free in our family, and I've been on the search for ideas. We love Vans waffles! So many great ways to eat your waffles! We use Vans to make waffle sundaes. Just add a little vanilla ice cream and some maple syrup and you have a total home run! These all look amazing and delicious! I need to try the banana split version asap! Those waffle ideas look so good and gluten free is so heplful to many people. I love the idea of the yogurt and fruit on top, too early for ice cream. Oh boy these look AMAZING!!! I love Van's waffles! We are not GF completely in our house, but I do cut back on it so I am excited to try these waffles!! Those look so good! It's nice to know that people can still enjoy delicious waffles even if they can't have gluten.